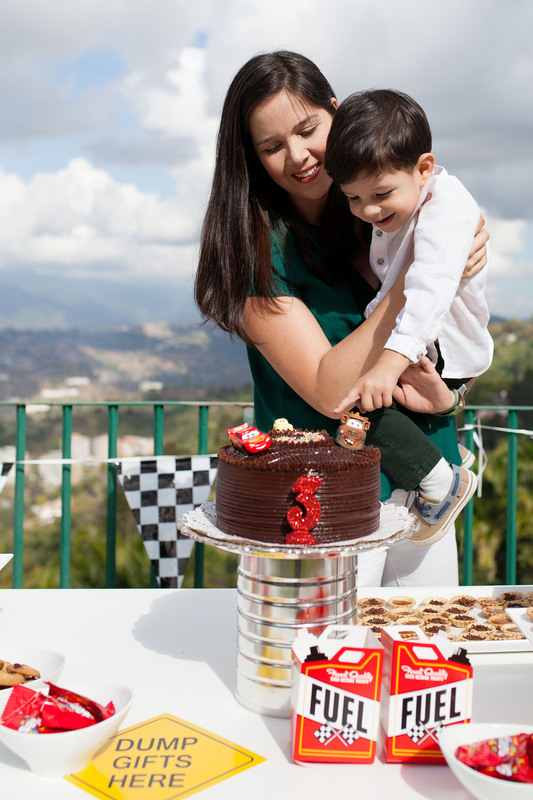 Employee Spotlight on Clara Gil! 79 seconds! Maybe I can make this shorter next time. The purpose of this blog post is to provide MSPs with a quick answer as to what exactly we do. Our website is being updated constantly, but this is a quick and effective way to answer your questions on-demand. 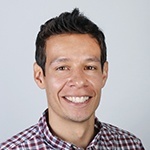 I am Derek Marin, founder of Simple Selling. I'm from Boston, I originally worked in digital marketing for a company called HubSpot. They sell an all-in-one sales and marketing platform and so I taught clients how to use this tool effectively. I left the company a couple years ago and have been doing marketing for different types of companies since. Last year my team and I decided to focus on sales and marketing for MSPs because we were doing well with one. We're a small team, it's just three of us, and our goal is to partner with MSPs that want to grow their MRR and dominate their region. First thing we need to do is to understand the context around the competitive landscape that we're all operating in, as consumers or as buyers. As you can see from the bar chart below, we LOVE to research online before we talk to a person! No surprise, right? We have search engines, review sites, and all of these things here. And so, are most MSPs aligning sales and marketing strategies to how people buy nowadays? No. We want to do our own research, and when we have a few doubts, that's the moment we engage a person, whether it's via live chat on a website or by making a call. This is how we buy, so as MSPs, we need to think about this buyer context and sell accordingly. 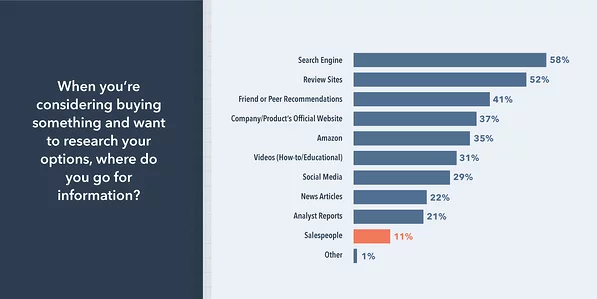 The latest LinkedIn's State of Sales explains that 96% of decision makers say they're more likely to consider brands, products, or services if the sales professional has a clear understanding of their needs, while 93% of decision makers value personalized communications. It means that when someone comes to your MSP website, or when someone calls, they expect the MSP to know a lot about them. They expect the Amazon and Netflix experience. So MSPs that meet that demand head on can get ahead. Given the expectations potential clients have, what are some of the specific challenges I know some of you guys have? Some of you aren't even getting to sales and marketing! Maybe the gap between where you want to be seems so far off for you now because you are so focused on taking care of clients. I hope that that's not the case for you, cause that means there's a lot of work ahead of to get sales and marketing going. For MSPs who are already investing time and resources in growth, the common mistake is focusing on short-term gains and a single channel, like cold-calling. Direct sales does work, we do it and it works! However, no single tactic has a high conversion rate, and you may be damaging your reputation by hitting the phones too hard. You may be annoying the heck out of people and not necessarily talking to them when they need IT support. The other mistake I commonly see is misguided content marketing. "Oh, you need landing pages, you need whitepapers, you need blogs." Of course, you need some of these things, but if everyone is doing it the exact same way, if everyone's copying the same blogs, or if everyone is putting super long whitepapers with long forms, it doesn't make you stand out! And one more downside of the whitepaper addiction is that, because so many blogs are out there, people know they don't need your damn whitepaper to get answers! The conversion rates have gone way down in the last few years on landing pages. Because if your website wants me to answer 10 questions, I'll just go back to Google and find another website with answers on a blog article. So unfortunately, landing pages are not as effective any more. So we need to take into account these things in our sales and marketing. Okay, so how does my MSP win in sales and marketing? How do we become known? How do we become unforgettable? It means doing things a little differently. 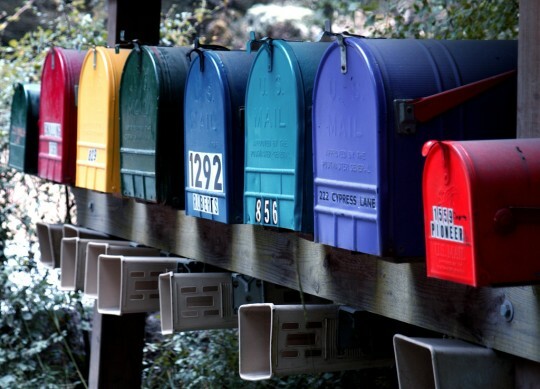 Believe it or not, direct mail is actually back and a good way to stand out. Think about it. How many emails you get in your inbox every day? You probably get over 100. But how many pieces of mail do you get? I bet it's way fewer. I bet you probably open most of your mail. As an agency, if I were representing your MSP, we would come up with a list of your target vertical, your target company. We'd come up with a letter that's personalized, talks about your company but in the context of your potential buyer. How much would you stand out if you just did that one thing? This is one of the things that we do. And the goal here is to just introduce yourself. Because in all likelihood, when someone opens that mail, they may not have been breached yet or necessarily buying IT services. But you're introducing yourself, just getting your name into their heads. Okay, let's look at a different scenario. Let's say a potential client is breached. The Business Manager goes to Google, it's an emergency. They type in "IT support near me" or "IT support Boston" or whatever. So NSI is my MSP client. 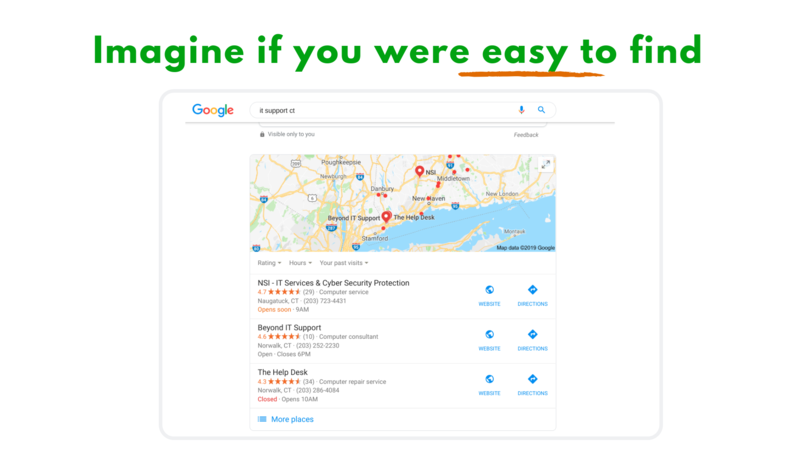 They have 29 Google reviews. We can't take responsibility for these reviews, NSI's doing great work for their clients, and it's their clients adding their reviews! But we do optimize the listing (more work to be done..) and automate the ask for reviews from happy clients. Reviews are awesome. 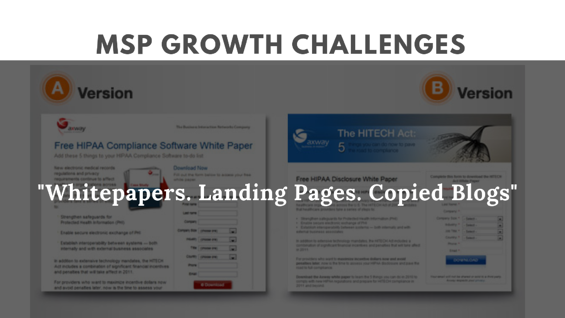 Imagine if your website wasn't the copycat MSP site with whitepaper addiction. Imagine if it was clean. Simple. Imagine if it had more video, because video's particularly a type of format that a lot of people want these days. This is something that Simple Selling works on. We want to make you come across as a real person talking to a friend, not like some super technical company that is hard to relate to. This is really important, telling stories as opposed to getting super technical and having too many landing pages and whatnot. We make sure that all of our MSPs have a presence on social media, and we try to add content that is specific to your target market. 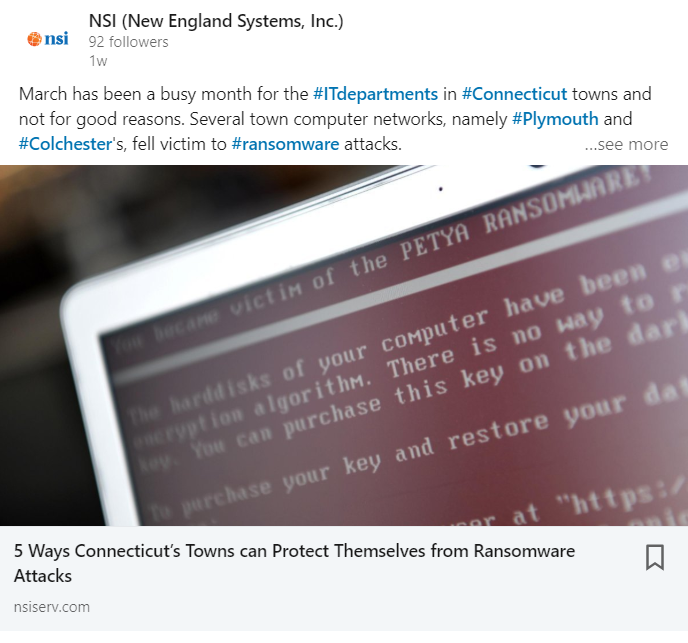 In the image below you can see an example of a blog that we shared on Facebook that was about ransomware attacks in towns, Connecticut municipalities. NSI is in Connecticut, a member of the Connecticut community, so this topic is relevant to busiensses around NSI! That's what being social means, talking about stuff that's relevant to your neighbors and community. It's not just posting, it's not just like five posts a day. It's about, how does this particular message resonate with our potential buyers? Everything we've mentioned up to this point is mainly marketing (direct mail, Google listing, blogs and social media). But we do direct sales, too. We call companies after we mail them. Let's imagine for a second that we called a company and Cheryl picked up. She wasn't ready to move forward to an IT assessment then, but over the next 4 months she lots of our marketing material and she remembered us when a hacker broke in. 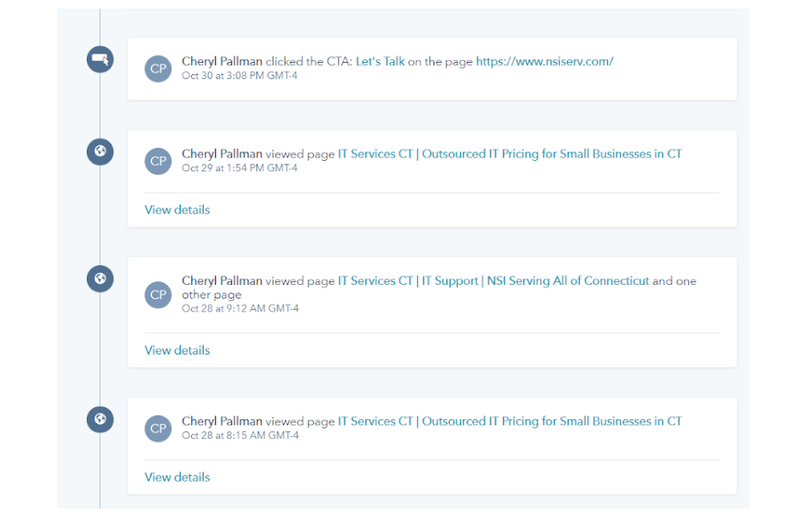 In the picture below you can see a snapshot of the history of a contact who came to NSI's website. We can see the different pages she's viewed. So if she chooses to engage with the bot or the live chat (Simple Selling), we would get a notification and talk to her right away and provide her with a personalized sales experience, like Amazon-esque sales experience, because I could look at all of her history with us! Closing the loop here between that gap on the robotic sales that telemarketing provides, by having something here which feels more personalized. These are the things that we do, and I'll leave you with our methodology, the main take-away here is we're helping you with all of the marketing and the sales up to the point where the lead comes in and they are sending an email, they're asking for a live chat, or they're making a call. Once they become, once they engage with me and I answer some questions for them, and I qualify them a little bit, then I create the appointment or the opportunity for you as the MSP. You as the MSP are in charge of closing the deal. And we can help with retention in the sense of creating some content on a knowledge base, or create a form of formalized referral program. MSP Marketing Myth "Don t Outsource Sales"
Once a week or so we send an email with our best content. We never bug you; we just send you our latest piece of content. 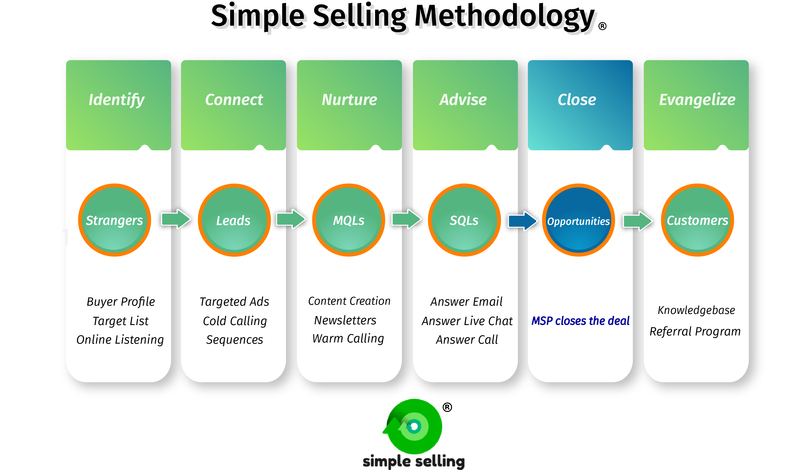 Simple Selling is a sales and marketing agency for MSPs. We help MSPs hit their MRR goals and become the dominant player in their region.